It’s not about saving housing, it’s about saving the banks. The Fed’s policies of keeping interest rates at zero and buying mortgage-backed securities are intended, we’re assured, to bolster the housing market by making it cheaper for buyers to borrow money. With mortgage rates under 4% and a trillion (soon to be two) dollars of dodgy mortgages transferred from the banks’ tottering balance sheets to the Fed’s wonderfully opaque balance sheet, then this appears plausible. But of course it’s all a PR ruse, like everything else the Fed says. If the Fed wanted to “save” housing and not the banks, why not buy mortgages directly from homeowners? 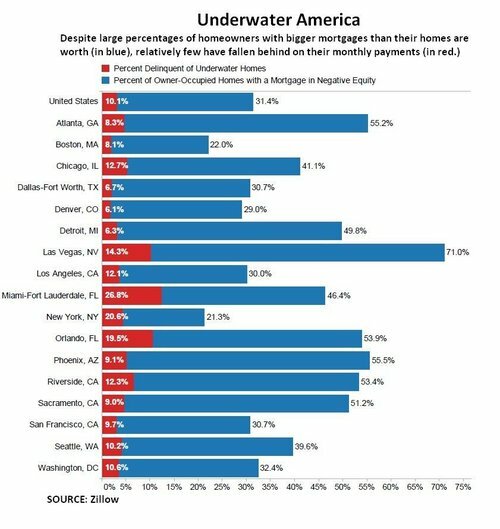 Instead of buying underwater mortgages from the banks, why not just buy the entire $10 trillion of residential mortgages outstanding and charge the homeowners the same rate the Fed charges banks, i.e. zero? The Fed’s goal is not to relieve debt-serfdom, it’s to enforce it. The entire purpose of the Fed’s policies is to ensure homeowners keep paying interest to banks for the rest of the lives, and to encourage those who are not yet debt-serfs to join the serfdom with a “cheap” mortgage. The Treasury has also been part of the debt-serfdom enforcement, as it bailed out Fannie Mae and Freddie Mac, not the borrowers who pay interest on Fannie and Freddie-backed loans. FHA has stepped in to fill the gap left by the implosion of Fannie and Freddie, and so government subsidies of the mortgage market are running at full steam. 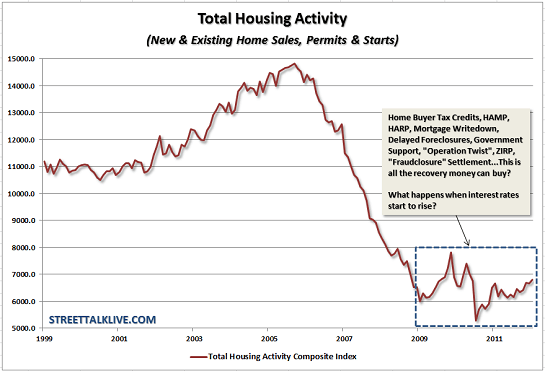 I just want to dispel the whole current myth about the importance of a housing recovery relative to the economy. At one point in our history, housing was a very important component of economic growth, currently at a mere 2.6% of GDP, that is no longer the case. So, while we spend billions upon billions of taxpayer dollars trying to bailout homeowners, forgiving bankers of their criminal misdeeds, and not dealing with defunct government agencies all in the name of saving the economy – in reality it has very little effect. Saving the banks by dumping trillions into housing is classic marginal return. Since the mechanism is broken–housing as the “wealth effect” generator and the source of billions in profits for banks–every $1 trillion in subsidies, give-aways, guarantees and mortgage purchases by the Fed yield fewer benefits to the real economy. For example, how are those 3% down payment, low-interest FHA mortgages working out? All praise to the new subprime – 1 out of 6 FHA insured loans is now delinquent. Yup, defaults are rising and the taxpayers will be bailing out the banks once again to the tune of tens of billions of dollars. This raises the question of the opportunity cost of squandering trillions on mortgages and banks: what else could the nation have done with those trillions?Something with a higher return, perhaps, such as upgrading the nation’s electrical grid? Something that actually generated sustainable growth because it was a high-yield investment and not a bail-out of fraud, friction and malinvestment? Once again the question arises: rather than loan $16 trillion to banks at 0%, why doesn’t the Fed just buy all residential mortgages for $10 trillion and charge 0.25% interest on the lot? That would cut out the banks, and that is the point here: the Fed’s policies are not aimed at “helping housing,” they’re aimed at protecting the banks’ income streams, assets and political power. Since the banks own $10 trillion in mortgages, housing is a key concern of the Fed’s “save and enrich the banks” campaign. Here’s the Fed’s policy in plain English: Debt-serfdom is good because it enriches the banks. All hail debt-serfdom, our goal and our god!